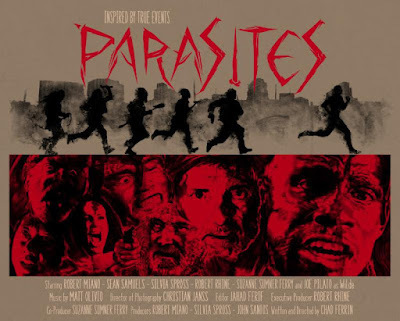 Chad Ferrin's harrowing festival favorite PARASITES will be available to rent or own in the US and Canada starting 24th January 2017 on iTunes, Amazon Instant, Google Play, Vudu and Xbox from 108 Media. Veteran genre director Ferrin (Someone's Knocking at the Door, Horse) presents one long night on Skid Row as a sadistic re-imagining on the true story of John Colter and his flight from the Blackfoot Indians. "Perfectly captures the vibe of early John Carpenter and George Romero"
Since the world premiere at the Fantasia International Film Festival, PARASITES has made audiences and critics scream, earning rave reviews for being both terrifying and thought-provoking. Dread Central hailed the film at Fantasia, praising the "white-knuckled tension and action that holds its ground." 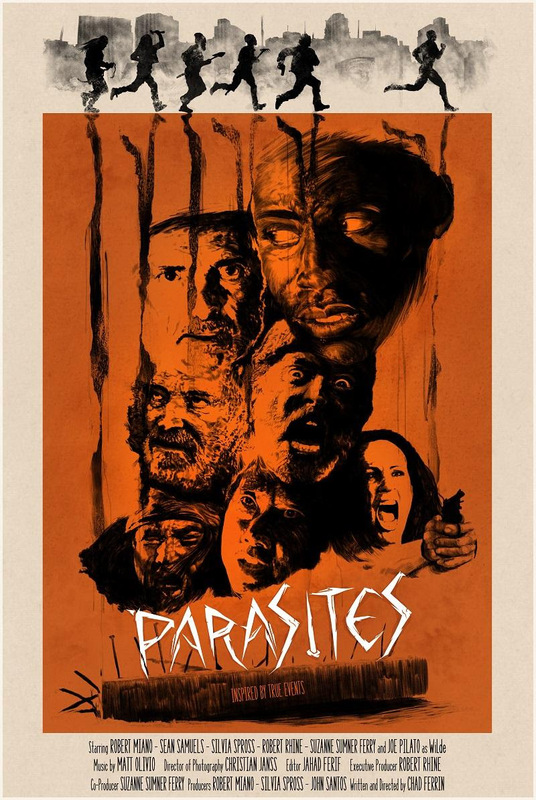 PARASITES has gone on to screen at a number of festivals, including HorrorHound, Shriekfest, STUFF MX, the New York City Horror Film Festival, Zinema Zombie Fest and more. Genre vet Robert Miano (Donnie Brasco) headlines as Wilco, the leader of a band of bloodthirsty vagrants who rule the underpasses and alleyways of downtown LA. When he and his men come across a trio of lost college boys (centered around newcomer Sean Samuels), all hell breaks loose. The industrial barbarianism of downtown Los Angeles is equal parts player and punisher in this survive-at-all-costs tale of a group of friends who get lost in the seedy streets where they encounter a crazed gang of homeless derelicts that captures and maims them one-by-one. One lucky man escapes on foot, naked and unarmed, with a pack of depraved transients in pursuit, staying only seconds ahead. Clinging to sanity and reduced to helpless prey, with only instinct to guide him, can he survive this coliseum of horror? 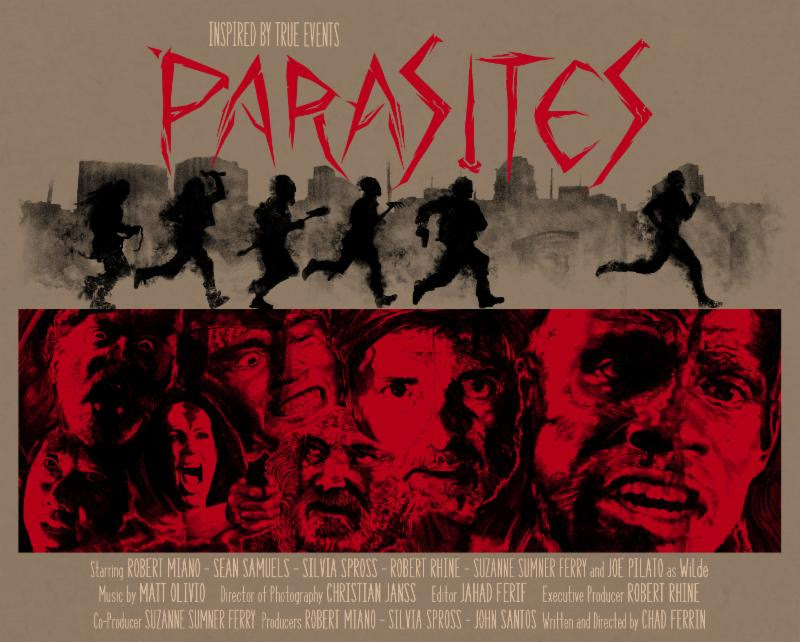 Parasites [TRAILER] from 108 Media on Vimeo.